Today’s resources provide many options to help the business leader through the hiring process. For example, there is a vast array of assessment tools, there are the scripted interview questions, there are background checks as well as financial background checks and much more. For the business leader or CEO to hire the right talent, they need to identify the right criteria or qualifications. Essentially, the business leader must define the challenge or business problem that the person hired will need to solve. With too much focus on quick and not enough focus on getting it right, there can be a jump-ahead to listing the criteria or qualifications before defining the business challenge. The criteria being used to identify and evaluate candidates can be the wrong criteria. Of course your business wants to quickly hire very intelligent and highly qualified people. People with the highest IQ’s might be likened to participants in a beauty pageant. It is fairly easy to identify the smartest ones in the room just like it is fairly easy to identify the most attractive people. Magazines frequently publish lists of the top ten best looking men or women. Highest IQ is not a Hiring Process. The common mistake made by business leaders is to conclude that the person with the highest IQ is therefore the best one to hire. It would be the same analogy to the best player would therefore make the best coach or the top sales producer would necessarily make the best sales manager. If it were only that easy ! 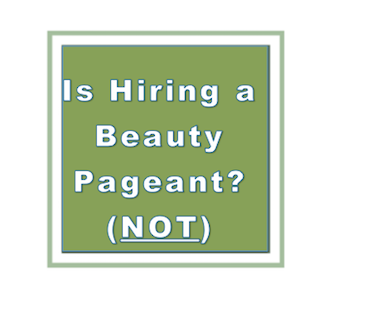 Hiring the “Right One” means that person fits the culture and the chemistry of your business so they can interact within your organization and deliver a valuable outcome.The Beauty Pageant does not measure for cultural fit. Most business leaders would agree that the most complex part of their business is the human beings who work in their business. As a result, it is better to get it right then make a hire right now. What if the best player on the field does not have the interest or the aptitude to relate from a coach’s perspective? What if the candidate with the highest IQ ends up being disliked by his or her co-workers? You will get the right talent with the right hiring process. We are back to the wrong criteria being used to get it right. So, what is the right criteria that will get the right talent? – First, it involves taking the time to define and declare the business challenge that the new hire will need to solve. – At the core of this issue is chemistry or cultural fit incorporated into the hiring process. – It requires investing time in a dialogue and really working to determine if the candidate is a great cultural fit for your business. – If you are looking to hire the smartest or the most attractive, you may be missing the one that fits the culture of your business. – In a word, it is “likability”. I have never met a business leader who hired someone they disliked. But, they may have liked them for the wrong reasons. – The complexity of the human being makes hiring both an art and a science. – Remember, hiring needs to be approached through a thoroughly proven and tested hiring process. As a CEO or business leader, ask yourself, “Is your hiring process a beauty pageant?” If you aren’t paying enough attention to likability, chemistry and cultural fit, maybe it is time to make changes to how your business is acquiring critical talent.